This by far was the portion of the trip I was most excited about. 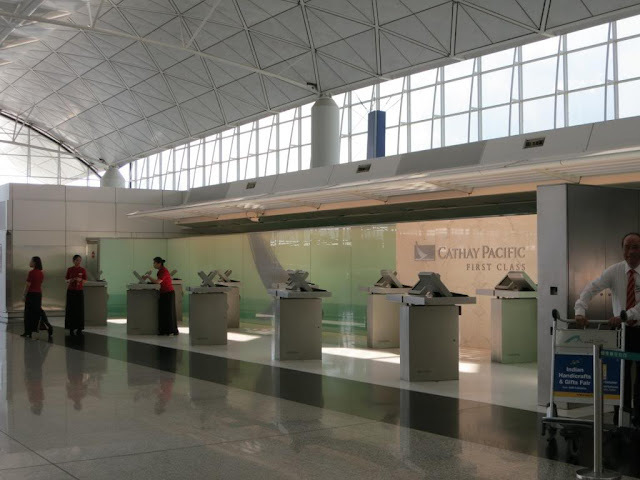 At the time, Cathay Pacific First Class awards were probably one of the most reviewed flights around. I was quite happy when I found availability for two on their 777 flight from HKG to SFO for 135,000 American AAdvantage miles and about $136 in taxes. One minor drawback to this cabin is that 1-1-1 seat arrangement does not offer any convenient seating for couples. Seats 1A and 2A on the left are quite private as the center seats can only be accessed from the right hand isle. 1D/1K and 2D/2K allow you to see the passenger in the opposite seat, but only if you both lean forward and into the isle. Not exactly romantic, but everything else in the cabin makes up for that. The 747 configuration of the cabin which has 3 additional seats in first does have 2 seats in the very front that are quite close together and is definitely the best option for traveling with someone if you can get these. Just a few days before our flight home, I checked the availability for alternate flights and found there was an opening on the earlier 747 flight. I jumped on this right away both because the flight was leaving in the afternoon, rather than around midnight, and because I doubt I will ever have the opportunity again to sit in the very front of a 747. I was also really hoping we would be able to get the 1A/1K seats together, but apparently there was a family already on that flight that had taken these seats. We ended up selecting seats 2K/3K which worked out great for us as I will explain below. On the day of our flight we took a taxi from the Grand Hyatt to the airport. As we did not fly in, I did not realize just how far out the airport is from the city. Even with all the tolls and miles, I was very happy with the ~$40 cab fare. We headed inside where I knew there was a dedicated first class check-in area. At this point, we had been traveling for two weeks and we were down to just about the last clean clothes in our luggage. I am quite sure I was wearing something ridiculous looking at the time. The man at the check-in desk kindly let us know that this was the check-in area for first class. While not rude, it definitely had the tone of "are you sure you are in the right place?" As soon as we provided him our confirmation numbers though he could not have been more helpful. Little did we know, we would also be seeing him quite a few more times that day. Now, if I was by myself, I would probably have run around the airport checking out all of the various lounges that CX offers to First and Business passengers, but I thought I would spare my wife and head to "The Wing" which was just beyond security and extremely easy to get to. To our surprise, the same man that had checked us in just a few minutes earlier was now stationed at the entrance to the lounge. He checked our carry on baggage at their luggage desk for us and welcomed us to the lounge. Although we were not particularly hungry, we could not pass on trying out a few of the menu items. We decided to leave our things at the lounge and go take a look around the airport. 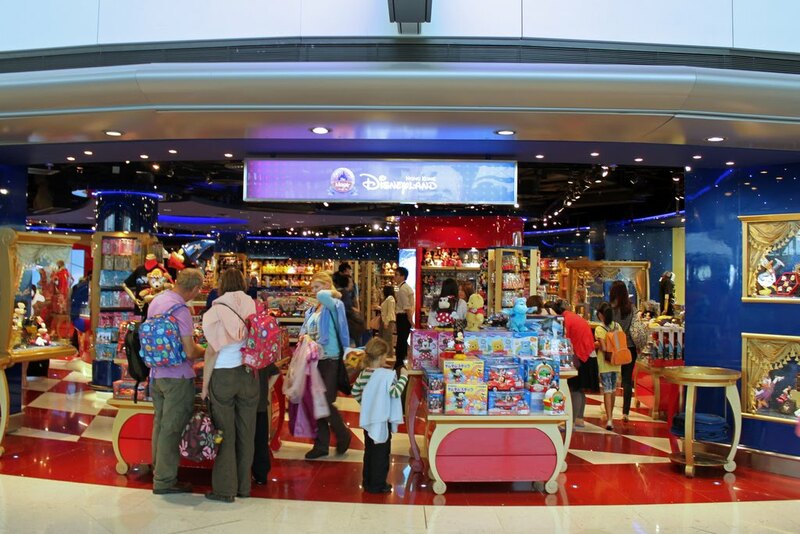 One store immediately grabbed our attention, the Disney Store! Even though we did not make it to Hong Kong Disney, we could not resist buying a few souvenirs to bring home. It was soon boarding time, we went back, collected our bags and headed to the gate. We cleared another small security checkpoint and were soon called to board. I definitely enjoyed boarding and turning left into the nose of the plane. This seat is huge! There is no way around it, it is the widest seat I have ever been in. Upon entering the cabin we found our seats already had complimentary pajamas, amenity kits, and fresh flowers in every seat. However, this is where things started to go from perfect to very wrong! We noticed it was a bit warm on the plane. As the rest of the plane continued to board, it just kept getting warmer. The captain informed us they were working on the air and as soon as we closed the main doors they would get things sorted. 15 minutes later, we were roasting. Everyone was sweating. One fellow first class passenger had already changed into his pajamas, but he was sweating so much he had soaked them. I assume he was a paid passenger on this flight (potentially a $12,000 one way ticket! ), he was absolutely floored by the situation and demanded that they fix it or let him off the plane. After another 5 minutes, the captain comes on and says that there is a problem with the plane and we will need to change planes! Although we had priority boarding getting on the plane, getting off turned into a zoo! We had to fight our way off the plane practically. Once we were on the ramp though, airport staff insisted that we were not allowed to re-enter the terminal! After quite a a lot of angry passengers complaining, we were eventually allowed back into the secure boarding area we had passed into earlier. Another 10 minutes here and they finally decided that there would be a new departure gate and we could re-enter the terminal. The same airline representative that had checked us in found us and let us know we could go back to the lounge and they would let us know when and where the new flight would be boarding. That was fine with me, but we overheard that they were passing out $10 food and beverage vouchers for the other passengers. My wife who had plans for these insisted we grab a pair. 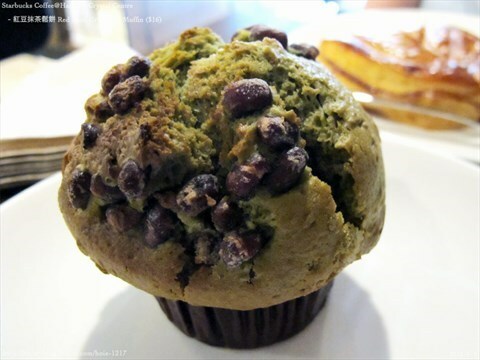 Before heading back to the lounge to wait we headed to Starbucks where we purchased my wife's favorite new treat that we haven't been able to find since, Green Tea Red Bean Muffins! Unfortunately we have not had another since. Thankfully, being Cathay's home airport, they had a new 747 ready to board again in under 2 hours. Boarding went smoothly again, but it seemed a little less special this time. The fresh flowers were not present, we had to bring our amenity kits and pajamas from the last plane as they would not be handing them out again, but luckily the cabin was nice and cool this time! Everything went smoothly from here on out though. We were soon airborne and ready for dinner! I had really been looking forward to the option to dine with my wife at our own table. Although a little tight, she was able to fit in the buddy seat opposite mine, complete with its own seatbelt. This would be our only time together for the duration of the flight. Nicer spread than most restaurants we eat in! and I had this ridiculously massive steak! and some fine chocolates to finish the meal. After dinner we made our beds and checked out the IFE which was nice, but was nearing the end of its life as the cabins were just about to be renovated a few months after our flights. At this point we also figured out that the easiest way to communicate was over the back of our seats. I am sure it looked funny, but apart from the very front seat, we were the only people seated on the right half of the cabin. Before landing we had the option of a light treat and breakfast. My wife went with the fruit and traditional breakfast and I tried out the dim sum. Overall this was the best food I have ever had on a plane. The food on our JAL flight was good, but we got a little too adventurous with the Japanese dishes. Additionally the presentation and place settings were wonderful. The flight went by quite fast. I maybe slept for 3 or 4 hours, which for me is a record on any flight. As always seems to be the case, they kept the cabin quite warm and the bedding although very comfortable was quite warm also. Comparing the flights, I definitely enjoyed Cathay over JAL. This could be partially due to the ground service at their home airport, but primarily due to the different approach from the flight staff. On JAL the crew was very wonderful, but they mostly leave you alone until you ask for anything. On Cathay anytime they saw we were awake or caught their eye they insisted on checking if they could do anything for you. Both flights were great, and who knows how long it will be until we get to enjoy first class again with prices going up and with our family growing in size!